Mullein flowers can be found at any herbal health store or even possibly in your back yard. This plant is tall with yellow flowers. Place (but do not pack) flowers in a clean glass jar. Cover with just enough olive oil to submerge all the flowers. Stir the flowers to release any air bubbles. Place in a warm location, such as the top of a refrigerator or in the sun, for 3 days. The drops can be used directly by putting 2 in each ear 3 times per day. Stored in a cool place, this oil can last for up to two years! Ingredients: 4 Garlic heads, divided into individual cloves and one pint of cider vinegar. Using a blender, blend the unpeeled garlic cloves and vinegar thoroughly. Transfer the mixture to a covered container and let sit at room temperature for at least 2 weeks. Strain and discard the garlic. There are more effective ways to treat ear infections, using only natural ingredients. For more information and my recommended resource on treating an ear infection. My home remedy is equal parts white vinegar and white alcohol. 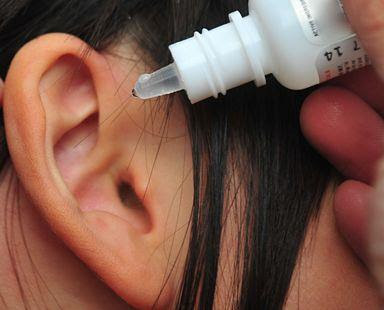 A few drops in each ear will keep keep your ears in good working order. I've used this for years. These won't solve an ear infection. If anything it could make it worse. There could be a hole in the ear drum, and then the vinegar or oil you're putting in your ear is going into the middle ear where the infection is. These could cause an infection in the ear canal since what you're putting in isn't sterile. Leave the vinegar and oil to your salads! I've treated many an ear infection with both these remedies and they do work very well. Just make sure that you are not dealing with a busted ear drum, first. As far as alcohol goes...NEVER PUT THIS IN AN INFECTED EAR...EVER!!!! I've used both these homemade remedies many times over the years and they both work. I would not keep it for two years, though and make sure you are not dealing with a ruptured ear drum first. As far as the comment on alcohol...NEVER, EVER, PUT ALCOHOL IN AN INFECTED EAR!!! !